One of the many reasons why full-time MBA programs are in decline has to do with the rising quality and interest in undergraduate business education. Many companies, particularly in the financial sector, have come to prefer undergrads because they are just as well prepared to make an immediate contribution at work and they are a lot cheaper to hire than MBA grads. So which undergraduate business programs are the best in the U.S.? Our new ranking of the best undergrad business schools, published today (Dec. 13), shows that the University of Pennsylvania’s Wharton School wins top honors for the second year in a row. Right behind Wharton is the University of Virginia’s McIntire School, Washington University’s Olin Business School, the University of Michigan’s Ross School of Business and the University of Notre Dame’s Mendoza College of Business. Wharton is a powerhouse of opportunity. Students lucky enough to overcome the school’s high admission hurdles are awarded with one of the best undergraduate teaching experiences in the world. And when they graduate, world-class employers are waiting for the school’s graduates with open arms. Some 95% of the graduates land jobs within three months of commencement at starting base salaries and sign-on bonuses that bring starting pay to a record $92,057 this year. In terms of average SAT scores for the incoming Class of 2018, Washington University’s Olin Business School boasted the highest score at 1,510 on the new 1600-point scoring scale. Southern Methodist University’s Cox School of Business followed with 1,494. The University of California-Berkeley Haas School of Business followed with a 1,490 average. Wharton was next, averaging 1,486. The average SAT among all participating schools was 1,308, a score in the 87th percentile, meaning that only 13% of all test takers scored that well or better. 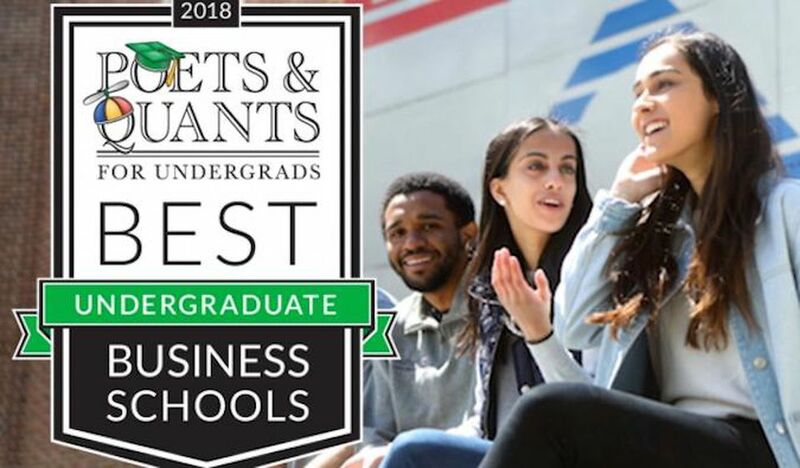 In all, 88 different undergraduate business school are ranked this year by Poets&Quants based on three equally weighted core categories — admissions standards, the student experience, and career outcomes. The ranking takes into account completed surveys from more than 11,000 recently graduated students from the ranked schools along with detailed surveys from nearly 100 undergraduate business schools in the U.S. Alumni surveys show that graduates of these ranked schools are an extraordinarily satisfied bunch. Asked on a range of one to ten, with ten being the most positive answer possible. whether they would recommend their alma mater to a close friend or colleague, alumni from some 71 of the 88 ranked schools scored a nine or above. At the very top on that question is Boston College’s Carroll School of Management, which ranked ninth overall.